We believe that the only people capable of destroying capitalism and creating a world in which everyone has control over their own life are those directly exploited by capital today: the working class. As we’ve pointed out, the ruling class know this and they work very hard to keep us divided and lacking in the skills that we need to make this change. This is something that has to be overcome before revolution is possible. We have to ‘build the new society in the shell of the old’. However, history shows that organisations built by the working class for our own benefit are often co-opted and turned against us. Trade unions, credit unions, cooperative traders and manufacturers – all of these and more have been used to defend rather than destroy capitalism. Authoritarian revolutionaries use this problem as an excuse to take over. According to them, the working class is only capable of a ‘trade union consciousness’, of haggling over wages and perks instead of toppling capitalism and building something new. What is needed, they claim, is their leadership. They will be the cause of the revolution, leading us – the poor stupid masses – into the light using any means necessary. History shows us that this leads only into new tyrannies. The alternative is for us to build a culture of resistance, a set of bonds of solidarity and understanding between many different people in many different places. These new relationships give us the confidence and the resources that we need to fight back wherever we are. This culture becomes a mass of tinder which is able to turn the spark from one struggle into a flame which can spread. This culture is not a particular organisation or set of principles or anything like that. It is composed of many different organisations and more than this of ideas, practices and attitudes that reveal to us our power as exploited but necessary parts of the capitalist system. This culture is as much about the self image and self belief in ourselves as it is about any particular set of ideas or organisations. A culture of resistance is in some way the sum of all the things that we do to survive and resist under capitalism. It is the big things like strikes and riots, occupations of factories and public buildings and huge organisations that fight for something in particular. Just as importantly, it is the small things as well. The little scams at work and the residents’ groups that make life a little bit more bearable at home. It’s hatred of the police and the bosses and pride in who you are and the community you live in. What all of these things have in common is that they create connections between us. These connections of trust and common purpose work against the everyday logic of capitalism. Capitalism splits us off from one another. We are given orders instead of taking part in decisions. When we buy something, whatever it is, all we know is its price, not who made it and why. The media tells us to fear immigrants and outsiders who they claim are trying to take what little we have. We are forced at every turn to cut ourselves off from the world, to be blind to the connections that we have with others. A culture of resistance restores those connections, making visible what capitalism tries to hide from us. Every object we use in our lives is made by other human beings. Every piece of food we eat, every bit of power we use, every cup of water we drink is there because the work of others made it possible. Capitalism hides this behind prices and company names. It takes the credit for making life possible by hiding the very things that connect us to everyone else in the world. A culture of resistance shows us how connected we are to other working class people. It rolls back the deceptions of capitalism and shows us how powerful we really are. It is not some abstract ideal, but instead it reveals the concrete reality that connects us all and blows away the abstractions and lies that capitalism uses to isolate us. A culture of resistance grows in the belly of capitalism and uses the connections between workers that capitalism in some cases creates to build the beginnings of an alternative. A culture of resistance builds structures and ideas of cooperation and solidarity that prefigure the world to come. A culture of resistance is the school in which we learn how to be free, how we become through the fight against capitalism everything that we will be after it. It is impossible to tell in advance what forms this culture of resistance will take. The needs and the imaginations of those involved will dictate what happens and how. However, it is possible to lay out the very broadest outline of how we can organise ourselves and fight back. We can look at what has worked in the past and what others are doing now, and point out how direct action and self organisation can be applied to a number of areas of everyday life. At work the confrontation between workers and bosses is at its most obvious. Workers want to work as little as possible for as much money as they can get, whereas bosses want as much work for as little pay. This is the nature of capitalism. The amount of effort management makes to control people at work points to the fact that at work we are incredibly powerful. When we work we create the profits that the ruling class needs to exist. When we disrupt the smooth running of a workplace through strike action or sabotage, we directly disrupt the ability of the ruling class to make the profits it depends on. For this reason, resistance at the points of work always has revolutionary potential, however small-scale it is. When we refuse to make profits for our bosses we threaten their very existence. When we talk about a social wage we’re talking about all the different ways that we can receive services from the state and the ruling class that are (in effect) part of our share of the profits of industry. Healthcare, subsidised and social housing, transport and utilities like water and electricity, libraries and social services, benefits, and many other things can be seen as part of the social wage. Like wage increases and shorter working days these services are often the result of previous rounds of struggle, victories won by the working class in the past. Struggles over the social wage take many forms but they usually involve a fairly straightforward confrontation between some arm of the state – the local council, for example – and a relatively clearly defined group of people who depend on a particular service. There are many different tactics available to those of us fighting these kind of struggles. Petitions and appeals to representatives are often used, and more often than not fail, but there are also forms of direct action that we can use. Occupations of threatened buildings and services, mass protests outside (and inside) government buildings, blockades and disruptions to the normal running of services, street riots and disorder. Social wage struggles are often the most imaginative of all struggles in terms of the tactics they use as it is often much harder to hurt the profits of those in charge. To do so we often have to question the legitimacy of the institutions of government themselves. At times of heightened struggle – for example during long lasting general strikes – this questioning can lead to a critical mass of people willing to take over the running of their own communities, providing for themselves the services they rely on. If this change of the social relationship can survive attempts at suppression and co-option then it can become a key feature of social revolution. These also get called identity struggles, however the word identity is really not up to the job of describing the kind of struggles we’re talking about here. Liberal (and even most radical), ways of talking about the struggles of those oppressed because of gender or sexuality, the struggle against white supremacy, or similar, do not recognise the relationship between these kinds of struggle and working class struggle. Sometimes they are seen as distractions and other times as ‘separate but equal’, but rarely are they seen as an integral part of the struggle against capitalism as a whole. 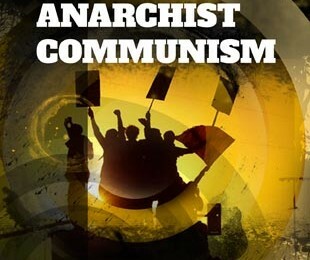 For anarchist communists capitalism is more than just as class system, it is a system that uses a whole range of hierarchies to maintain the power of a minority. Resistance to all of these hierarchies should be seen as resistance to capitalism. This does not mean, however, that separate organisations are not needed by people fighting patriarchy, white supremacy and so on. Just because the struggles of, say, women are important in the struggle against capitalism does not mean that those struggles can simply be folded into some ‘wider’ fight against capitalism. Because of this it is necessary for those of us who experience certain forms of oppression to form our own communities, not only to organise together but also to talk together without having to justify what we say to people who do not have the same struggles. These groups provide a space in which we can understand what is unique about our own oppressions and in which we can be free of the prejudices – conscious or unconscious – of those who do not share the same experiences. These groups can be the basis of communities of resistance, where a shared understanding develops into a set of shared tactics and actions to take on both the state and the everyday prejudice and violence that can make life hell for those of us seen as outside the norm.